Pooh Sized Traveling – Part I Magic Kingdom – What's for Dinner Moms? This is part of a series I did a couple years ago. This is the last Disney post for a week or so. We are not a tiny family. I am 5’8″ tall and a 30-32W. My partner is short 5’1″ and 26-28W. Even our children are fairly tall for their ages our dear daughter is 5′ 9″ and our son is now 6′ 0″. So we are always aware of our size – height and weight on all the rides. On a previous trip I took a tape measure and a small notebook to note some of the seat sizes where I could. Here are some of our tips for making the trip a bit easier if you are worried about being Pooh sized for some of our favorite rides. In Mickey’s Philharmagic the seats are 16 1/2″ from inside of the arm rest to the other arm rest and front to back. We try to get a seat on the end of a row and place our children between us so that one of them is on the end closest to the next person. Often the theaters are not crowded when we enter so the children end up not sitting next to anyone else. It’s a Small World After All – We have learned to ride this ride in two rows. We each take a child and ask to be place in two rows. We also make sure we are both not sitting on the same side of the boat or the boat seriously leans to one side and looks like it is going to start taking on water at any moment. Also, height can be a problem on this ride. Avoid riding in the front row if you are tall as the seat height is only 11″. I felt like my knees were at my ears most of the ride and it was very uncomfortable. The Many Adventures of Winnie the Pooh – This ride has a large enough seat and leg room for us but getting into the Honey Pot I had to be careful to step onto the step on the side of the ride, then turn sideways and make sure I lifted my belly up and over the side of the Honey Pot. The first time I rode I came out with a large bruise on my hip where I hit the side of the Honey Pot as I entered the ride. The bar on this ride lowers automatically so just make sure if you riding with children they do not pull down on it because it locks automatically and you could be in a tight spot for the rest of the ride. Mad Tea Cups – This ride is similar to Winnie the Pooh’s Honey Pots in that getting into the cup was the most difficult part for us. We each rode with one child and when getting into the cup had to make sure to turn sideways and make sure our hips cleared the edge of the cup. As with most rides have the child get in first then you can sit right near the door and do not need to slide around the steering wheel in the center. Once in the seat it was fine. Also, on exiting make sure you step up on the door and then step to the ground. Try not to exit stepping down directly to the ground or you may end up stuck at the door or with a bruise on your thighs or hips. 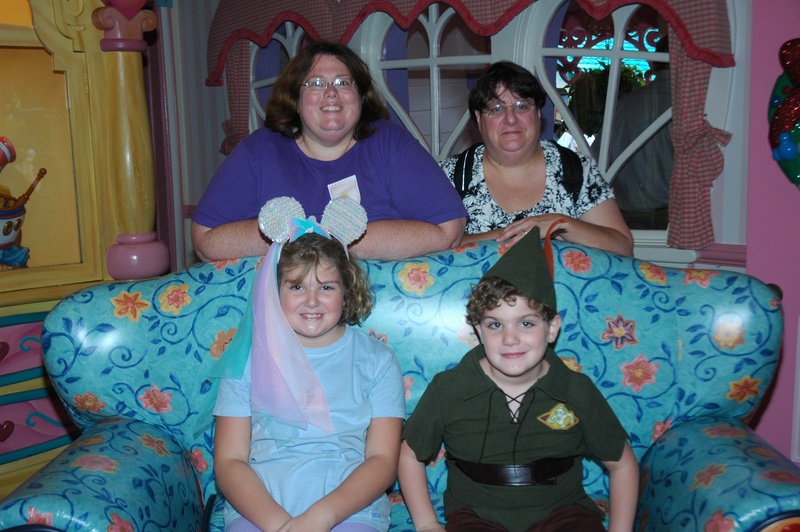 Peter Pan’s Flight – We each rode with a child and had no problems. The bar automatically closes just make sure, again, that you or your children do not pull down on the bar as it is closing or it may tighten too tight. Enchanted Tales with Belle – This is beautiful story telling starts in a small room where you stand to watch the story. Then the “magic” happens and you are lead into a hallway where you stand for another part of the story. Finally you are led into the library for the final part of the story. The seating is benches and there is plenty of seating room. Under the Sea – Journey of the Little Mermaid – This ride has vehicles that are similar to the ships on Peter Pan and “Doom Buggies” in the Haunted Mansion (see below). Dumbo the Flying Elephant – When my children were little I would always take the smaller of the two and we fit snuggly on this ride. Now that they are older we each get our own elephant. We have no problem asking for one elephant each. Seven Dwarfs Mine Train – This fast moving roller coaster like ride was one of the rides in Magic Kingdom that I did not fit on. You have to be able to put both of your feet into one section of the car and close the bar. I could have ridden if they had let me put one foot in each side but for safety reasons this is not allowed. My daughter who is 5’9″ and a size 18 finds this ride uncomfortable. My partner can fit but she is much shorter and can barely squeeze in. If you want to try it ask but there is no problem if you do not fit. There is a waiting area for you to wait for your family to return. The Haunted Mansion – Before the new line renovation it was the turnstile at the entrance that used to give me trouble. My hips were just too wide to go through comfortably so I would use the wheelchair entrance. Now there is no turnstile and there are no problems. The “Doom Buggies” are similar to Peter Pan in that they are a bench seat and we have no problems here as long as the children do not pull down on the bar at anytime during the ride. Note, the bar will tighten during the ride if a child suddenly pulls downwards on it and it can get very uncomfortable. The Hall of Presidents – This is one of my son’s favorite shows at Walt Disney World. He was seriously disappointed that it was not longer. He loves the Presidents. The seats are about 15 1/2″ wide from inside the arm rest to the other arm rest in the handicapped section of the theater. My son used to use a medical stroller at WDW to help him deal with sounds, smells and people at Disney World as he is Autistic. I moved to the regular seating area, one row from the back, where the seat width was a full inch wider. Doesn’t sound like much but it really is. Again, sitting with the children between us or sitting with an empty seat between us (we have never been in the theater when it was more than 1/2 full) was the best option for us. Liberty Square Riverboat – This may sound funny but the biggest surprise to me was that there was little to no seating on the boat. If you are going on this ride for a peaceful ride around the river that is great. Just be ready to stand for the entire ride. After a long day of walking this was not what we expected on our first trip. I hunted the whole boat for a place to sit and could only find one bench. Splash Mountain – I don’t like fast rides or getting wet but I have ridden this several times over the years. I ride in a seat by myself now, asking for a seat for 1 is never a problem, but when the children were smaller I could easily take the smallest one with me. Again the biggest problem on this ride was the leg room. I would sit in the front of the car as it seems to have the most leg room. Big Thunder Mountain Railroad – This ride has a bar that comes down across your lap to hold you in. It is more a jarring roller coaster going side-to-side rather than up and down. The only thing that makes me nervous is if the bar fits across my lap then my child is not secure because they are so much smaller. You may wish to ride alone doing a child swap if one of you cannot take a smaller child. Pirates of the Caribbean – This ride is similar to It’s a Small World After All. The boats are very similar so we ride it in a similar manner. The Jungle Cruise – The most difficult part of this boat ride is entering and exiting the boat. It is a large step down into the boat. If you have any balance or depth perception issues, as I do, make sure you step carefully. Sometimes there can be water on the seat as you step in or on the deck that can be slippery so hold on. Buzz Lightyear Space Ranger Spin – This is my favorite ride in all of Magic Kingdom. There are no issues for me riding this ride. We tend to ride it at least 5-6 times a trip! Very similar in set up to Doom Buggies in construction. Carousel of Progress – Many bypass this “old-fashioned” show but it is my favorite in all of Walt Disney World. I love that Walt Disney had such a hand in creating it and I love it for the historical purposes of Walt Disney World. The seats are similar to old auditorium seats, metal with wooden arm rests. They are slightly smaller than most seats in Walt Disney World but the theater is very rarely even half full so you can sit with an empty seat next to you if you wish. Space Mountain – I hate roller coasters. I don’t like being scared so I have not ridden this ride in many years. My partner and children rode on our last trip in June 2011 and she had no problem fitting in the seat. She had a bit of trouble exiting the ride due to knee issues but her size was not an impediment to riding. There is a demo seat that you can discretely ask a cast member to try out of sight of the entire line of people if you are in fear of not fitting on the ride. If you fit you can return to the line, if not there is an exit you can go right out and no one but you will ever know. We love Walt Disney World. It is a place we all feel comfortable and we don’t have to worry about our size being an impediment to enjoying everything with our children. Dynamite post! I agree with you about Disney a hundred percent. My wife is 5′ 1” and I’m 5′ 7” and Disney is quite comfortable for us too. I always enjoy your posts and this one is quite important. Great post & so thoughtful of you to measure everything! I’ve been to WDW over 25 times, and it’s honestly something that I never even considered, but I’m sure this will help a lot of people! Thank you! I could never figure out why some theaters were better for me than others but now I know.